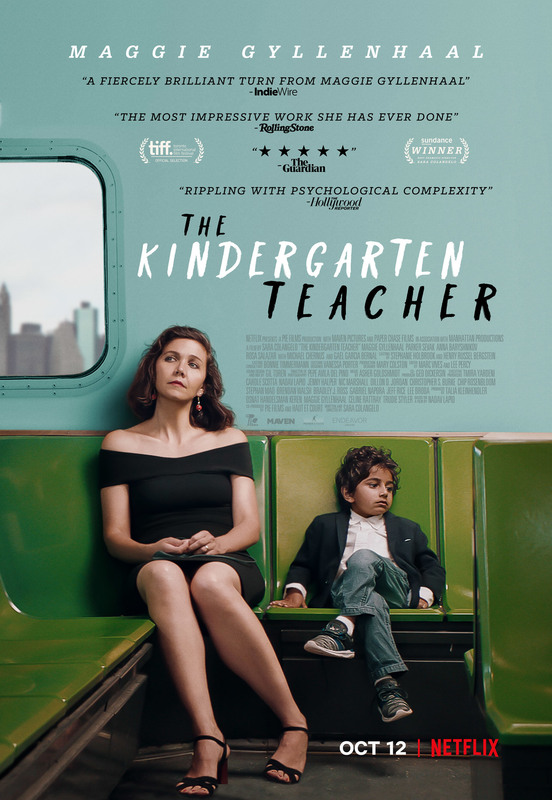 Lisa Spinelli (Maggie Gyllenhaal) is an overworked and unhappy kindergarten teacher who discovers that one of her five-year-old students is an apparent literary prodigy. Growing obsessed with nurturing the boy’s talents, she wildly crosses boundaries of professional – even legal – behaviour to save his poetic instincts from being smothered by a disinterested father and an uncaring world. The Kindergarten Teacher is an American remake of Nadiv Lapid’s acclaimed Israeli production from 2015. It comes from independent film director Sara Colangelo, who reportedly maintain an identical storyline while geographically and culturally shifting events to the USA. I have not seen Lapid’s original film and therefore cannot compare the two versions. Taken entirely on its own merits it is something of a disappointment. It is a moral mess, and deliberately so, but the kind of discomfort it generates is less engaging and more irritating to sit through. Lisa is a frustrated creative writer whose own attempts at poetry do not impress the members of her adult writing class. When she discovers one of her students wrote an astounding piece, and subsequently passes it off as her own, there is a tremendous potential for a black comedy that is never fully realised. Instead the film tracks a little further before Lisa decides to push the child Jimmy (Parker Sevak) as the author of their own work instead. From there it’s a remarkably short jump to a personal relationship bordering queasily close to paedophilia, and that’s a ridiculously strong story element to simply toss onto a pile. Colangelo simply does not earn it, or treat it with the gravity such a development demands. From there-on-in the film is fatally wounded, and never recovers. It is a deep shame because Gyllenhaal remains one of America’s finest contemporary actors, and acts the living daylights of what she’s given, despite it being ridiculous and unconvincing. Had the screenplay really plumbed the depths of an inappropriate and emotionally damaged obsession, there could be a controversial powerhouse of a film in the making. Instead it is all too hard to take seriously. The same goes for several supporting actors, including Gael Garcia Bernal as Lisa’s increasingly fascinated poetry tutor who believes she is the real author of Jimmy’s poems. He does good work here, but it’s in aid of a faulty project. Technical aspects of the film are rock-solid; in the end it’s all dragged down by the screenplay. It even ends abruptly, with little in the way of resolution or explanation. It almost feels as if Colangelo ran out of ideas on how to resolve the narrative. We are refused any definitive answers into what motivated Lisa, because what little insight we get keeps changing. There’s plenty of talent on show here, but not in the script. It’s a shaky house built from bad foundations. The Kindergarten Teacher recently played at the Melbourne International Film Festival. It will premiere in Netflix this October.